Sometimes the Universe is quite clever. No wait…it’s ALWAYS clever, it’s just that sometimes I’m not paying attention. Today I was, and it paid off. While catching up on my emails, I read a post by Cate on her blog CommuniCATE that struck a chord with me. You see, she discovered a challenge called Creative Every Day. Naturally I was interested, so I followed the link for more info. 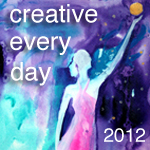 Creative Every Day is the brainchild of Leah Piken Kolidas and she encourages people to be creative, every day – get it?! Knew you would! This challenge isn’t just for artists in the traditional sense. Leah promotes creativity in a broader sense. Immediately I knew the Universe was trying to tell me something. Yes I am a writer, but I am also creative in other ways too. So each week I will post about my creative journey. I’m excited to incorporate this into my blog and my life. Oh! Did I mention that Leah is an artist? Yeah, she has GORGEOUS works of art that I’m already planning on purchasing for my collection. I mean what better way to get in a creative mood than to be surrounded by art? So what are you waiting for? Go sign up! Be creative and do it now! Leah’s made it so easy, it’s impossible to say no. *Special thanks to Cate for blogging about it and Leah for being a creative inspiration! Grimm Brothers, Eat Your Heart Out! I love the idea of being creative every day 🙂 Looking forward to following your creative journey! I love this idea! Can't wait to read your posts! Thanks for the comments ladies! !